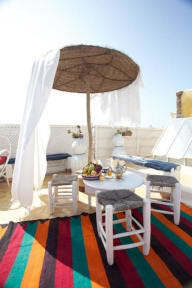 Riad Lunetoile i Essaouira, Marokko: Bestill nå! Riad Lunetoile Essaouira, situated in the heart of the Medina, with sea-views from the top terrace and from apartment 5, is the ideal relaxing, comfortable, holiday home / guest-house / B&B, to rent, in Essaouira. Ideal for surfers, individuals, couples or families... our Moroccan hospitality will enthrall you.....so, Submit yourself to a gentle introduction to true Moroccan hospitality, mixed with a little European comfort, and spiced up with a few Indian accessories. Enjoy all, that the Orient, has to offer, whilst still being in Africa! Savour our home-made BISUITS and sip mint tea from our sea-facing, rooftop terrace and listen to the waves of the Atlantic Ocean, crashing onto the rocks, whilst you let yourself drift into the mysteries of this far-away, Arabic, land. The minimum booking 3 nights from 23rd to 4th January 2018. Our riad can accommodate up to 16 people and is ideally suited to everyone - individuals, small groups, or families.The entire Riad can also be booked, please inquire in advance. We speak English, French, Italian and Arabic.